1914 Duke Kahanamoku's Alaia 8 ft 6.5"
MANUFACTURER: Hudson's Timber Yard, Blackwattle Bay, Glebe, Sydney (?). One piece imported solid 100 year old Sugar pine (Pinus lambertiana) timber blank supplied and prepared (tempate cut out) by Hudson's Timber Yard, [Blackwattle Bay, Glebe], Sydney. (Hudson's may have had a yard on the north side?). Hand shaped by Duke Kahanamoku (possibly) at Freshwater Beach, December 1914. Bottom: very slightly rolled,the often reported "slight concave" in the bottom is not evident. FIN: none [standard for the period]. The board was originally plain timber, but over the years has several elements added to it. Circa 1953, it had four metal letters (DUKE) affixed with screws to the board and painted white pin-lines. Previously exhibited in the Club Room of the Freshwater Surf Lifesaving Club, in 2012 it was refurbished and relocated to the club's Heritage Room. The current display also includes three lateral bolts, that were inside the board. Three lateral bolts, that were inside the board are now displayed at the foot of the board in a timber case. 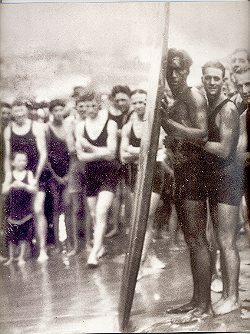 Invited to tour Australia as the 1912 Olympic swimming champion, Duke Kahanamoku was expected to demonstrate surfboard riding, particularly when in Sydney where there was a growing enthusiasm for the sport. Swimming officials promoted their carnivals with dramatic coloured posters showing him surfriding. "Did you bring your surf board with you? ", to which he replied: "Why no, we were told the use of boards was not permitted in Australia." Evidently noticing the look of keen disappointment on my face, he quickly added: "But I can easily make one here." - Cecil Healey: The Duke Reaches Sydney, The Referee, 16 December 1914, page 1. I wanted to try riding the waves on a surf-board, but it was forbidden. - Alexander Hume Ford: Beach Culture in Sydney, Australia. The Red Funnel, Dunedin, New Zealand.Volume VI, Number 5, June 1908, page 469. Thoms: Surfmovies (2000) page 22. Although often reported, there never was an outright ban on using surfboards in Sydney, however there were government regulations restricting their use when considered dangerous to surf bathers, see Before Duke 1900 - 1914. 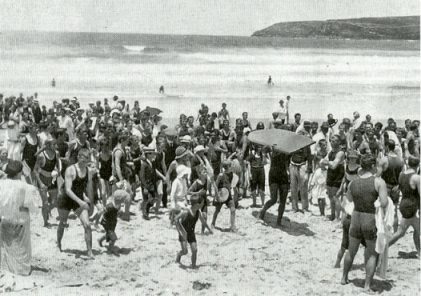 While most of the boards causing distress were small prone boards ridden among crowds of surf-bathers, there were probably about ten large boards, that is designed to be ridden standing, on Sydneys' beaches. ... and there are several of these in use at both Coogee and at Maroubra. 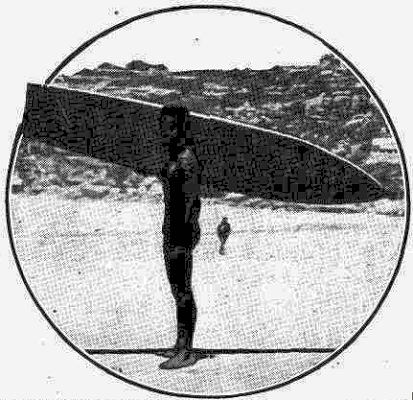 - Harald Baker: Surfing, Evening News, Sydney, Saturday 11 April 1914, page 10. 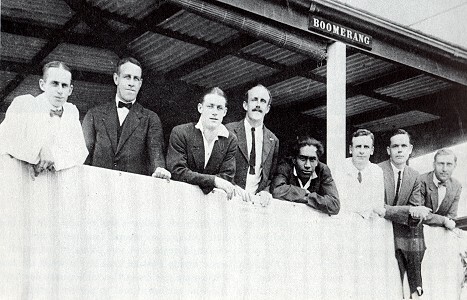 The enthusiasm of the Australian surfriders saw arrangements for Duke to be accommodated at Boomerang Camp at Freshwater Beach. His hosts were Freshwater club and Surf Bathing Association officials, Roy Doyle and Don Mclntyre. As secretary of the Freshwater SLSC and Hon. Secretary of the Surf Bathing Association, McIntrye played an important role in the organising of the exhibitions. - C.B.Maxwell: Surf (1949), page 237. Plans were also made for the construction of a surfboard. a design and asked George Hudson's timber yard to make up a board for me. showed Australians for the first time how it was done. A timber firm, George Hudson’s, donated a piece of sugar pine 9 ft long, 2 ft wide and 3" thick. bottom of the board, to give it lift on a wave. Note that Harris' "the finer designing of the bottom of the board" has been often interpreted incorrectly to indicate that the bottom had a concave section. Although Hudson's apparently had several yards in Sydney, their principle timber yard was in Blackwattle Bay, Glebe, and it is the likely source of the billet, which could have been cut sometime before the 20th December. 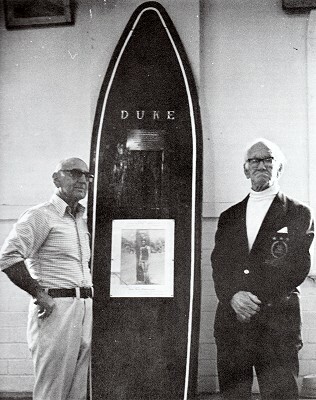 The board used by Kahanamoku weighed 78lb, and was sugar pine. sufficiently long, could not be procured in Sydney. - W. F. Corbett: Wonderful Surf Riding, The Sun, 24 December 1914, page 6. The board is 8ft. 6in. long, 2 ft. wide, and three inches through at its thickest part. - The Wonderful Water Feats of Duke Kahanamouku, The Globe and Sunday Times War Pictorial, Sydney, Saturday 2 January 1915, page 3. Given the technology of the day, presumably, after cutting the template with a hand saw the board was rough shaped with an adze and a draw knife then finished with various grades of sandpaper. - see Snow McAlister: Sprint Walker, Solid Wood Boards and Victorian Surfing. Tracks magazine, Sydney, circa 1972, reprinted in The Best of Tracks, 1973, page 191. After shaping, the board finished at 8 foot 6.5 inches long, 23 inches wide, and 2 3/4 inches thick. These dimensions recorded with the assistance of, and confirmed by, Eric Middledorp, the board's custodian, Freshwater Surf Life Saving Club, 23rd November, 2012. Eric had earlier weighed the board at 78 pounds. After arriving in Sydney on the 14th December, Duke Kahanamoku and his pary had public engagements on the evening of the 16th and on 19th in Sydney, and probably some familarization with the local conditions and intial training for the swimming carnivals. It seems unlikely that he could have relocated from his suite in Oxford Hotel to Freshwater until the 20th December. - Swimming- Kahanamoku's Arrival, Sydney Morning Herald, Wednesday 16 December 1914, page 6.
at Freshwater on Wednesday morning, at 11 o'clock. The famous swimmer will give an exhibition of breaker shooting and board shooting. - Surf Display by Kahanamoku, Sydney Morning Herald, 22 December 1914, page 12. Such an announcement could only have been made with Kahanamoku's assessment of the surfriding conditions and after the construction of his board, presumably sometime between the 20th and the 21st December. Remarkably, despite a crowd of spectators reported to be "some 2000 or 3000 people," the exhibition was cancelled by the Swimming Association. - W. F. C. Corbett: Kahanamoku Did Not Show, The Sun, 23 December 1914, page 5. Hudson's apparently had several yards in Sydney, including one north of the harbour, their principle timber yard was in Blackwattle Bay, Glebe, and this the likely source of the billet, which could have been cut sometime before the 20th December. While Kahanamoku had a reputation among surfriders as a top surfboard shaper at Waikiki, this was not reported in the press as it was feared by his supporters that any income from this could jeopardise his amateur status. The surfboards already in use in Sydney were either imported from Waikiki, or locally produced copies of these, and there would have been keen interest to see a master at work and gain experience to improve local shaping skills. As such, the billet was probably transported to the Manly-Freshwater area where the final shaping and finishing, including the application and drying of a coat of natural oil and/or marine varnish, was carried out before a gallery of interested observers. Duke was always eager to "talk-surf" and was generous with his knowledge, and this was the first shaping master-class in Australia. The board was 'first' ridden at Freshwater Beach on 24th December, 1914, in a remarkable demonstration of skill. In crumbling waves, up to about six feet, he cut left, cut right, and rode standing on his head. RIDING THE BREAKERS ON A BOARD AT FRESHWATER YESTERDAY. - Acrobatics in the Surf, The Daily Telegraph, Friday 25 th December 1914, page 7. A second photograph, published a week later by the Sunday Times , shows Duke "styling," obviously for the cameraman, in the shore break. A larger wave, like that ridden in the photograph above, breaks outside . This edition also included a photograph of Duke carrying the board on his shoulder, the traditional manner, with the rocky undeveloped south point of Freshwater in the background. HIS EXHILARATING PASTIME OF SURF BOARDRIDING. standing on his surf board shooting the breakers at Freshwater. Sydney, Saturday 2 January 1915, page 3. KAHANAMOUKU CARRYING THE IMMENSE BOARD ON WHICH HE CARRIES OUT HIS WONDERFUL WATER FEATS. It measures 8ft 6in by 2ft. is 3in through at its thickest part, and weighs over 70lb. 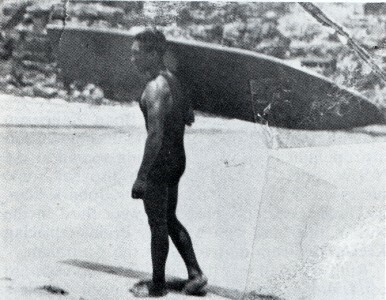 A similar, and often printed (although usually undated) photograph of Duke Kahanamoku carrying the board in the same manner, was likely to be taken at the same time on the same day. 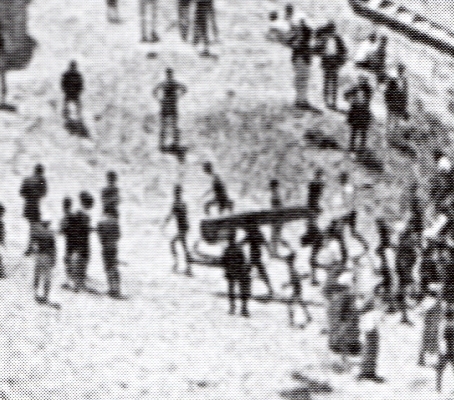 Note the absence of spectators, or any other beach-goers, and the shadows indicating that both were shot at around noon. - Myers: Freshwater LSC (1983) page 56. The following day was Christmas and over the next four days Duke (and his swimming companion, George Cunha) had few obligations apart from preparing for their preliminary heats on 30 December 1914 at the Domain Baths for the State Championships on Saturday 2nd January 1915. While Cunha won his heat at the trials, Duke Kahanamoku,"owing to a slight ear trouble, did not start," although there was an improvement and he "would be able to enter the water, perhaps today (31st December)." Nevertheless, he was seeded directly through to the final on Saturday. - Sydney Morning Herald, 31 December 1914, page 5. The touring party may have attended a Schoolboy's Carnival,at the Domain Baths on the28 December, where they gave a sswimming demonstration. The January swimming carnivals were an outstanding success, with a packed house and on 6th, Kahanamoku set a new world record for the 100 yards sprint of 53 4/5 seconds. - The Referee, 6 January 1915, page 16. The record was reported world wide, including an article in the sports section of the New York Times. - New York Times, 14 February 1915, Sports Section, page S3. With the completion of two highly successful swimming carnivals, Duke returned to Boomerang and on Sunday 10th January gave two exhibitions comprising both surfboard riding and body surfing. In the morning he appeared at Freshwater and in the afternoon at South Steyne, Manly. Note that the dedication plate, Reg Harris, Manly LSC (1961) page 66, and Nat Young, The History of Surfing (1983) page 47, record the date as "15 January 1915". This is not possible, on the 15th January the Hawai'ian party was already in Brisbane preparing for a series of Queensland swimming carnivals. George Cunha, and the manager of the tour arrived in Brisbane last night by the Sydney mail train. - Swimming - Duke Kahanamoku - Arrival in Brisbane, The Brisbane Courier, Friday 15 January 1915, page 3. A large number of photographs were taken at the morning exhibition at Freshwater. Duke Kahanamoku reception, Freshwater Clubhouse, Sunday 10th January 1915. S. Mound, club captain with F insignia, standing next to Duke. Forbes in Myers: Freshwater LSC (1958,1983) page 17. Accredited: 23 December 1914, Snow McAlister. Accredited: 15 January 1915, Snow McAlister. - Hall and Ambrose: Memories of Duke (1995) page 40. Accredited: December 1914, Courtesy Heather Rose. other surf riding boards in this photograph. Click the image for a detailed analysis. find another copy without page join! Duke Kahanamoku, board carry apres surf, , Freshwater Beach, Sunday 10th January 1915. Note the board's shadow on the sand . Harry Hay, Olympic swimmer (to his right), Don McIntyre, far left. 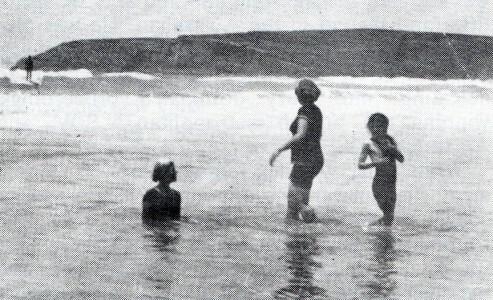 Freshwater Beach, Sunday 10th January 1915. - Margan and Finney: Pictorial History (1970) page 112. Note Duke's swimsuit drying on rail, left. Duke, Harry Hay, Olympic swimmer, to his left. Longhurst: Lifesaver (2000) page 16. This photograph of Duke riding the board at Freshwater could have be taken on any time before or after the exhibition of the 10th January. Right: Duke Kahanamoku surfboard riding, Freshwater Beach, December 1914 - January 1915.
circa January - February 1915. - Kampion: Stoked (1997) page 40. 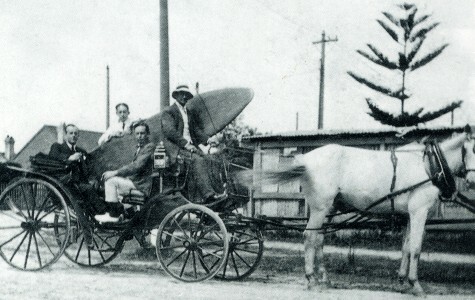 The White Creamy Ponies was a "taxi" company serving the Manly area, with a long association with the local surf lifesaving movement. Mr F. W. J. Donovan (president), Mr A. W. Relph (secretary) and the committee of the club. - Unaccredited: Manly Surf Carnival, Sydney Morning Herald, Monday 21 March 1910, page 10. 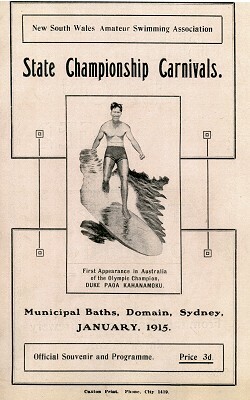 The following weeks he continued a program of swimming races and surfing demonstrations at metropolitan beaches including Coogee, Cronulla, Dee Why and other Northern beaches. At Dee Why ... tandem, large crowd, ..
At Cronulla ... race in belt, picnic, .. Above: Duke Kahanamoku surfboard riding, Cronulla 6th February 1915. Cronulla NSW 6th February 1915. Warshaw : Surfriders (1997) page 16 [cropped]. One of the early Manly boardriders, Basil Kirke, had a long career as a radio presenter, and later an administator, in the Australian Broadcasting Corporation (ABC). In 1928 he gave his first radio broadcast of his "History of Surf Bathing" on Sydney radio, and after transfering to Perth, WA, in 1929?, he gave further broadcasts and similar presentations at various WA surf lifesaving events, often titled "'The History of Surf Bathing in Australia." - 2BL, Sydney, The Brisbane Courier, 22 December 1928 , page 24. - News and Notes,The West Australian, Perth, 14 June1930, page 14. - Broadcast Programmes- 6WF, Mirror, Perth, Saturday 18 October 1930, page 4. 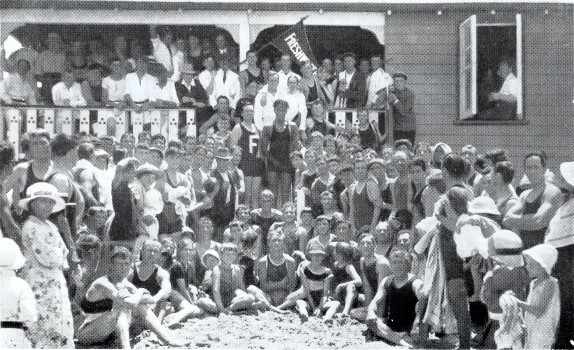 In a trans-national radio broadcast in 1931, in Perth, Kirke introduced Mr. C. D. Paterson, then president of the New South Wans Surf Life Saving Association, transmitting his greetings to the North Coltesloe Surf Life Saving and Athletic Club from Manly, New South Wales, via telephone. - Broadcast Programmes- 6WF, The West Australian, Perth, Monday 26 January 1931, page 6. Patrica Gilmore's article, When Ironing Boards Took To The Waves, published in the Sydney Morning Herald in late 1947, was an early summary of the history of surfboard riding in Sydney, that was probably was the source for many subsequent accounts. The first surfboard (was) imported to Australia (by) Mr. C. D. Patterson in 1912 from Honolulu, (a) nine-feet piece of redwood, it ended in the Patterson household as an ironing board! (Thereafter) Jack Reynolds, Norman Roberts, and "Looney" Walker were inspired to make boards with Les Hynes (a builder at North Steyne). In 1914, the Australian Swimming Association decided to invite Duke Kahanamoku to this country—as a swimmer. While here, he was asked to give an exhibition of surfboard riding. Having no board, he picked out some sugar pine from George Hudson's, and made one. This board—which is now in the proud possession of Claude West—was eight feet six inches long, and concave underneath. It was in February, 1915, that the Australian board enthusiasts had their first opportunity of seeing a "board expert" on the waves. - Patrica Gilmore: When Ironing Boards Took To The Waves, Sydney Morning Herald, Saturday 29 November 1947, page 12. Several of Patrica Gilmore's inaccuracies were reproduced in C. Bede Maxwell's Surf - Australians Against the Sea, published in 1949. A hard-cover book, endorsed by the SLSA, its readership and its impact was far more widespead. West was to become the Hawaiian's (Kahanamoku's) star pupil. By the time the kindly, generous instructor had left Australia, Claude West had become the most proficient surf-rider on the coast. Annexing the Australian championship in the same year, 1915, he successfully defended this until 1925, contemporaries swearing that surely young West had suckers on his feet. No wave seemed able to throw him. - C.B.Maxwell: Surf - Australians Against the Sea (1949), page 237. Although not specifically stated in the text, there is some implication that ???? West does not appear any contemporary reports of surfboard riding preceding or during the Kahanamoku tour. He is first mentioned in print in February 1915, when he and (Freddie) Williams rescued Neil Peter Nielson, 27, and Alfred Ferns, 10, from the North Steyne surf with a line (and reel? ); Neilson, however, did not recover consciousness. - Drowned at Manly, The Sydney Morning Herald , Wednesday 24 February 1915, page 12. Furthermore, Claude West is not mentioned in any of the reports of Sydney surfboard riders in Australia's first serial surfing publication, The Surf, published weekly during the summer of 1917-1918. - The Surf - A Journal of Sport and Pastime, Con. Drew, 1 December 1917 - 6 April 1918. There was no "Australian (surfboard) championship in 1915," all such references in the literature are only retrospective, and are strictly incorrect. There were a number of surfboard exhibitions or contests in the years immediately following the Kahanamoku tour, often in association with body and/or boat surf riding events at various surf carnivals. However, West is not listed as a place-getter in any of these early events (provide a list of winners? ), and his first victory was probably a surfboard "display" at North Steyne at the end of 1919, five years after the Kahanamoku exhibitions. S. Dowling, also representing the Manly Club, was in second place. - North Steyne Carnival, The Sydney Morning Herald, Monday 8 December 1919, page 8. In researching her book, Maxwell obtained, probably at her request, a brief paper, Notes on surfboard riding, by the then current President of the Surf Life Saving Association, Adrian Curlewis. eventually gave it to Claude West, and he still has it, a prized possession. Mitchell Library, Sydney, ML MSS 196, page 3. Adrian Curlewis received his first lessons in surfboard riding from John Ralston at Palm Beach in the early 1920s. One of the better Sydney beaches for boardriding, Ralston had introduced boards there in 1919. Owner in hospital through using same. The seller was Claude West, who had been injured while transferring a patient from the board to a surfboat. Within several years, Curlewis became a "surfboard virtuoso." - Maxwell: Surf (1949) , pages 238-239. - Helen Frizell: Judge Curlewis,The Australian Women's Weekly, Saturday 3 February 1951, page 17. Adrian Curlewis headstand, Palm Beach, circa 1929. A founding member of the Palm Beach Surf Life Saving Club, Curlewis was club captain (1923-28) and president (1929-33), after which he was president of the Surf Life Saving Association of Australia, except for a period military service in WW2, from 1934 to 1975.
http://adb.anu.edu.au/biography/curlewis-sir-adrian-herbert-frederic-12382/text22253, accessed 30 August 2013.
team which visited Honolulu in 1939 say Duke was often to be seen paddling around on his 'ski from Australia'. - Op. cit.,, pages 3 and 4. Presumably the board was in the possession of the Walkers at least until the early 1920s, when his West's reputation was firmly established, and was most probably handed over with his retirement from competitive boardriding, circa 1925. There were several Walker's amoungst Australia's earliest surfboard enthusiasts, their familiar relationships somewhat confusing. The best was Tommy Walker, who returned fom Waikiki circa 1910 with a 10ft surfboard, and surfed, and gave demonstrations, at Manly, Freshwater, and on the north coast, at Yamba. - [Harry Hay]:Tommy Walker says "I Brought First Surfboard To Australia", The Referee, 23 February 1939, page 16. - Freshwater Carnival, Daily Telegraph, 27 January 1912, page 21. - Yamba Surf Life Saving Brigade, Clarence and Richmond Examiner, Grafton, 5 January 1915, page 7. Patrica Gilmore's article, When Ironing Boards Took To The Waves, published in the Sydney Morning Herald in late 1947, outlined the history of surfboardriding in Sydney that appears to be the source for many subsequent accounts. Thc.ede 5 January rr1915, page 7. C. Bede Maxwell reported that C.D. Paterson, a member of the North Steyne club, acquired a "real" Hawaiian surfboard in 1912, and lists a number of locals who attempted to ride the board, beginning with "the Walker Brothers." - Maxwell: Surf (1949) , page 235. Manly has always been a boardman's beach since the Walkers and Claude West first became prominent in the game. - Maxwell: Surf (1949) , page 241. They ride with almost Hawaiian deptness, particularly young Walker who is quite the "surf board king." - Reg "Snowy" Baker: General Physical Culture (1910), page 53. Claude West was prominant performer in surfboard events from 1919 to 1924-1925. It is unclear if West rode Duke's board in these events, indeed for this period it may have not been in his possession. It was certainly not the board that injured him in the early 1920s, and was then sold to Adrian Curlewis. 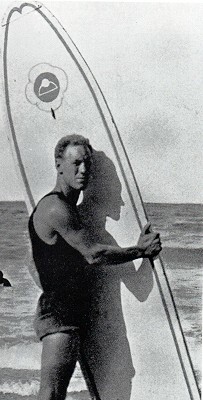 In a photograph from the period (circa 1926) he is shown holding a board, painted white with a surf-reel logo and dark pinelines. It is possible that this is Duke's board, under a heavy coat of paint. - Thoms: Surfmovies (2000) page 23. 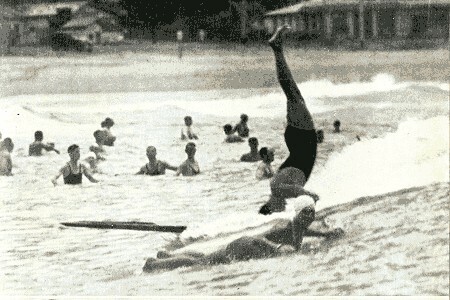 In 1952-1953 Claude West donated the board to the Freshwater Surf Lifesaving Club. At this time it is possible that he refurbished the board, adding four metal letters, perhaps somewhat unsuitable for use in the surf, white pin-lines, and a white nose patch with an extra truncated dark pin-line. Alternatively, it is just as likely that the decor was added only immediately before the expected return of Duke Kahanamoku to Freshwater on his visit to Australia with the visiting US/Hawaiian Olympic Surf Team in 1956. The additions are evident in several photographs taken at Freshwater in 1956. Forbes in Myers: Freshwater SLSC (1983) page 18, cropped. - Manly Daily, May 1980.
and on occassion was used by Club members, including myself. - Joe Larkin, noted in a phone conversation, February 2004, with many thanks. Sometime in the mid-1950s it had become the practice to inscribe the names of the annual club champions, effectively making it a "trophy board." Several club members objected to this and the names were removed, and on 15 November 1956, the Freshwater club arranged for a bronze/chrome plate, detailing the board's provinence, to be affixed below the metal letters. - Eric Middledorp, phone conversation, 2013. Over the next twenty years the board was a regular feature at surfriding contests and special events. In 1957-1958 Claude West was filmed riding the board on "small waves at Manly Beach (featured) in Bud Browne's film Surf Down Under (1958). - Warshaw: Encyclopedia (2004) page 690. 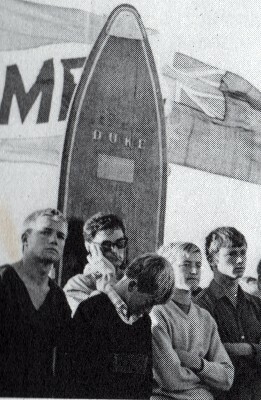 In November 1963, Duke again travelled to Australia for the launch of Jack Pollard's The Australian Surfrider - The Complete Book on Board and Body Surfing. A compilation of articles covering surfboards, body surfing, surfskis and surfboats, Duke contributed a brief foreward to the book under the subtitle "first man to ride a surfboard in Australia." In the text, he slightly modififed that claim to "I had the honour of making the first demonstration of surfboard riding in Australia." - Pollard: The Australian Surfrider (1963) page 7. Neither claim is strictly correct. In December 1965, a third impression was published, retitled The Surfrider - The Complete Book on Board and Body Surfing, and the colour cover photograph of Dee Why Point was replaced with one of Sunset Beach, Oahu. When I left Australia back in 1915 I gave my board to a chap who seemed to be the most promising of the local riders. This was Claude West, who later won a whole stack of Australian surfriding championships. I met Claude again, too, in 1963, when I saw my old board at Freshwater Surf Club, to whom Claude had donated it in memory of my first ride. - Pollard: The Surfrider (1965) page 7. While the reunion with Isabel Letham and Claude West in 1963, coinciding with the launch of the book, is recalled, their well documented reunion in 1956 is not. The recollection that "I gave my board to the most promising of the local riders ... Claude West" was, no doubt, substantially modified by time and and circumstance, not the least being Maxwell's account in her influential Surf (1949). West certainly was a talented surfboard rider, had the board in his possession for forty years, and in donating it to the Freshwater SLSC he firmly established his connection to the board. - Margan and Finney: Pictorial History (1970), page 169. This image shows the board with the metal plate affixed. - courtesy Eric Middledorp, Freshwater SLSC. pinline appears to be removed. fell off a truck in 1975, and split down the middle, and was run over. The elderly (Claude) West restored it expertly. - Sandra Kimberly Hall: The Million Dollar Surfboard, Longboard, April-May 1996, page 74. Said to be returning from a contest in Queensland, Hall does not note that at the time the board was in West's care, on loan from Freshwater, and he was ultimately responsible for the damage. The "expert restoration" was probably carried out behind closed doors, and out of sight of club officals. It was at this point that the three lateral steel bolts, found that inside the board in a major refurbishment in 2011-2012, were most likely installed, shown below. Following these major repairs the white nose patch with extra truncated pinline appears to have beeen removed, while the metal letters and the dedication plate were re-affixed. Right: Snowy McAlister and Claude West, Freshwater SLCS, circa 1978. In 1980, ithe board was present at Claude West's furneral, and it appeared in 1988 in the Hawaiian Pavillion at Brisbane's World Fair. Isabel Letham's contribution was recognised when she was made a life member and the patron of the Australian Womens Board Riders Association in 1978, and in 1983 she was photographed with a contigent of the then current professional women surfers at Freshwater. In this photograph, the metal plate is absent, possibly the result of another "refurnishment." - Warringah Library: Making Waves- Isabel Letham 1899-1995 , pages 19 and 21. 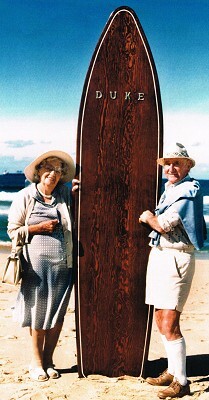 The photograph of the board with Isabel Letham and Snowy McAlister, (Freshwater, 1983-4), right, was possibly taken on the same day. - image courtesy Eric Middledorp., Freshwater SLSC. Over the following decades the board probably had several restorations or refurbishments. In photographs of the board at its appearance at significant events and contests over these years, the dedication plate has disappeared and returned in various postions. Currently exhibited in the Heritage Room, Freshwater Surf Life Saving Club, The Esplanade, Harbord NSW, ph : 02 9905 3741. Several three, if not more, other surfboards were shaped by Duke Kahanamoku while in Australia, these possibly donated to raise donations to the war effort. 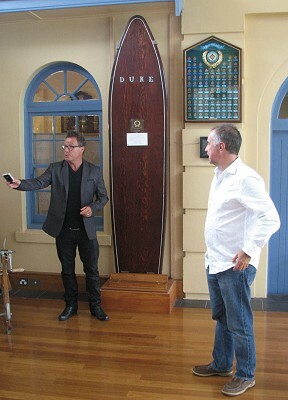 One board was presented to the Surf Bathing Association of New South Wales and subsequently became the property of a Cronulla Club member, Ron 'Prawn' Bowden. The history of the other two is currently unknown, however one may have been the board used by "Sprint" Walker when he introduced (standup) surfriding to Victoria at Portsea in 1926. This board itself had four copies made while in Victoria. His design would be replicated for the next 25 years. (See Plans and Specifications : Alaia, 1938). Returning to Hawaii Kahanamoku left the board, and a great amount of surf knowledge, initially with the Walker brothers, who later passed the board on to Claude West. West is first mentioned in the Sydney press in performing a rescue at North Steyne with [Freddie] Williams in 1915. - Drowned at Manly, Sydney Morning Herald, Wednesday 24 February 1915, page 12. Claude West rode the board, dominating surfboard competitions in the period 1922? to 1928, and was later recognised as the first Australian Board Champion. 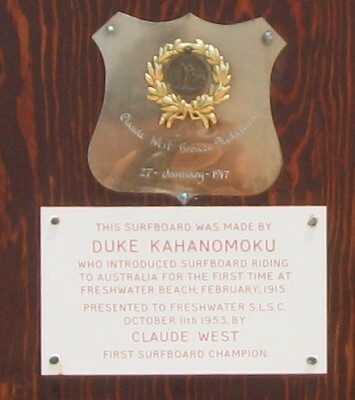 In 1953 Claude West donated the board to the Freshwater Surf Lifesaving Club. 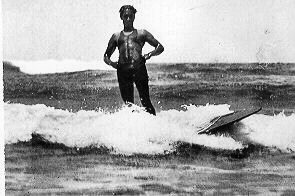 After leaving Australia in 1915 Duke Kahanamoku gave further exhibitions in New Zealand, on another "makeshift" board. Previously, the board was mounted in a tight fitting timber sided and glass topped case in the Club Room, which made examination of the board difficult. The current exhibition is a significant improvement. The board photographs were taken on the 23rd November 2012 on the occassion of the release of Phi Jarratt's excellent Surfing Australia, when the board was relocated to the beach front for photographs with the invited guests. The occasion also celebrated 50 years of Surfing Australia, with the release of a special coin by the Australian Mint and the announcement of the release in 2013 of four surfing stamps by Australia Post. The guest of honor was acting Australian Prime Minister, Wayne Swan and the master of ceremonies Channel 10 weather reporter, Tim Bailey. Other guests included Phil Jarrett and Norm Innis, Chairman of Surfing Australia. Notable surfers included Mark Richards, Terry Fitzgerald, Mark Warren, Barton Lynch, Nick Carroll, Tom Carroll, and Layne Beachley. Many thanks to the Freshwater Surf Life Saving Club, the board's curator, Eric Middledorp, Tim Baker, and Nick Carroll. Snow McAlister : Sprint Walker, Solid Wood Boards and Victorian Surfing. Phil Abraham, photographs by Nathan Smith: Hidden Valley, Longboarding, Edition 18 November - December 2001, pages 35-36. Jarratt: Surfing Australia (2012) pages 24-31. Geoff Cater (1998-2014) : #100 Duke Kahanamoku Sugar Pine, 8ft 6'', 1914. A compilation of articles covering surfboards, body surfing, surfskis and surfboats, Duke contributed a brief foreward under the subtitle "first man to ride a surfboard in Australia." - Pollard: The Austrailian Surfrider (1963) page 7. In December 1965, a Third Impression was published, retitled The Surfrider - The Complete Book on Board and Body Surfing, and the cover photograph of Dee Why Point was replaced with one of Sunset Beach, Oahu. "My memories of Australia go back to 1915 when I was world freestyle champion and gave the first demonstration of surfboard riding in Australia. A few Australian surfers had tried the boards but they hadn't got the knack, so I pencilled out a design and asked George Hudson's timber yard to make up a board for me. I finished off the board by hand myself and at Freshwater Beach on Sydney's northside, showed Australians for the first time how it was done. There was a tiny little girl in the crowd that day who by her manner seemed more excited than all in the crowd. I put her up on my shoulders and we made a few good rides. In 1963, we met again — Isobel Latham, now of course, a mature adult. 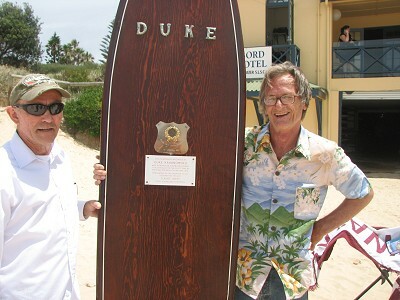 I met Claude again, too, in 1963, when I saw my old board at Freshwater Surf Club, to whom Claude had donated it in memory of my first ride." The account notes the presence of surfboard riders in Australia before 1914, and confirms that the template, from his "pencilled out design," was cut out at by a carpenter at Hudson's before he "finished off the board by hand." These recollections are probably modified by time and and circumstance, for example the claim that "I gave my board to the most promising of the local riders ... Claude West." West certainly was a talented surfboard rider, had the board for a long time, and in donating it to the Freshwater SLSC he firmly established his connection to the board. The account notes the presence of surfboardriders in Australia before 1914, and confirms that the template, from his "pencilled out design," was cut out at by a carpenter at Hudson's before he "finished off the board by hand."